One of the common challenges in business planning is that one often has a better handle on predicting expenses than revenues. It doesn’t mean you’re 100% sure about what your costs are going to be, but for many folks, when they start looking at sales, it’s a crap shoot. As a result, many business plans tend to “make up” revenue numbers to show a profit, confident that they’ll somehow get there. Most business plans I read present revenue numbers that are more fiction than good prediction. Break even analysis is one way around this dilemma. For that, all you need are two numbers: estimated annual fixed costs (that one’s often pretty straightforward), and something called unit contribution. Fixed costs reflect those expenses that you’ll incur regardless of sales levels. It normally includes things like salaries and benefits, space, technology costs, accounting/legal/marketing, and so on. Unit contribution, on the other hand, represents how much of each unit or dollar of sales you get to keep — after subtracting all variable costs required to produce that unit, typically accounted for as cost of goods sold. The basic break even formula is fixed costs divided by unit contribution. The result is the number of units that need to be sold to cover all your fixed costs. If you sell fewer units, then you lose money; more, you make money. 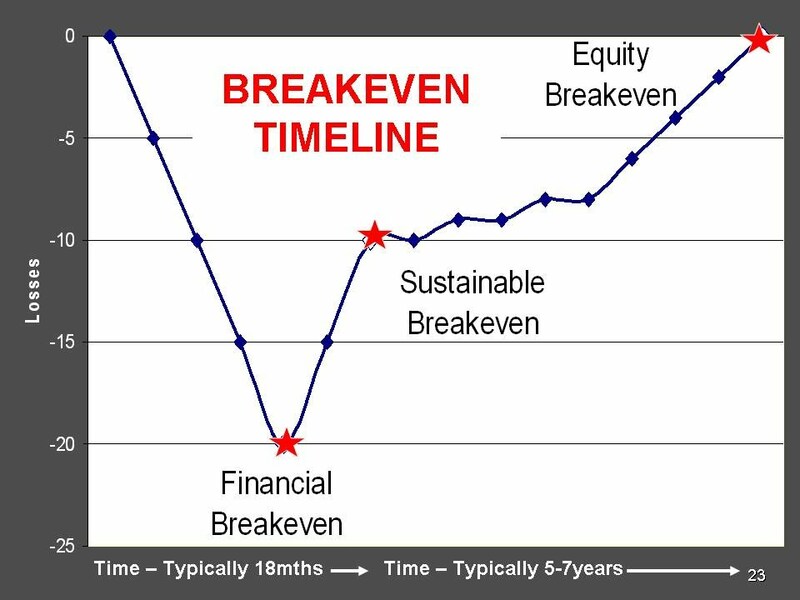 An alternative version of break even analysis divides fixed costs by unit contribution percentage, which leads to the dollars (rather than units) that need to be sold to achieve break even. Once you have that break even number, you can evaluate whether it’s practical to at least reach that level of sales. Be hard nosed about that. Compare it other businesses that you’ve researched. In many cases, this might be enough to demonstrate that your plan is not workable, as least as you have thought about it so far. Or it might just provide you with enough confidence that hitting that number will be relatively easy. Either way, unless it includes revenue projections that are rock solid, every business plan should include some kind of break even analysis. Don’t leave home without them!